Brain Dots APK 2.6.2 is a game which will provide a new experience for all mobile gamers. This game is very good for people who want to get a challenge since this game is one of the puzzle game for mobile phone. Having rating 4 stars means that this game can be a favorite one. Here, the gamers must be ready to squeeze their brain in order that thw two balls, the pink and the blue one can find each other. The obstacles in Brain Dot need a fabulous trick without breaking the physics laws using the pencil to reach the goal of the game. 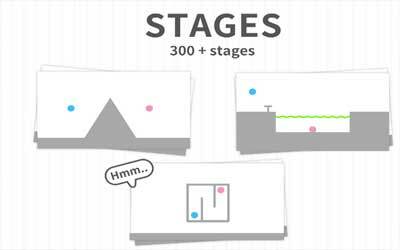 Then, even though in the first level of it will be a little bit easy, but the gamers will find the opposite of it in the advanced level. When the gamers often fail to get the goal of this puzzle mobile game, they can get a hint which can help them so much. After that, in this mobile game, it can be downloaded freely, yet the pencil can be got by in-app purchases although it can be got by the coins collected after completing the mission or scenario of the game. Furthermore, as an attractive puzzle game, the graphic is very good. Added with the sound effect an d background music, this game will be greater. With the various languages provided such as English, French, Spanish, Chines, Japanese and many more, this game have been downloaded 1.429 times all over the world. This mobile game also can be for Android 3.0 up to the Android 4.3, so that is why there will be more Android users will play this game. Last, for all Android gamers who want to save and share the game in facebook, twitter and YouTube, they can choose this Brain Dots for Android.